Scotland’s national bard Robert Burns had many close and interesting connections with medical men during his short life. The College’s historical collections unfortunately don’t contain a large number of items relating to Burns. Naturally, the library holds William Finday’s 1898 book Robert Burns and the Medical Profession (Paisley: Alexander Gardner), among other 19th century texts on the poet. Burns’s connection to Dr John Moore is well-known, and we can illustrate this with our portrait of Moore, which hangs in College Hall. A more hidden and subtle connection concerns one of the most fascinating of the poet’s relationships. His affair with Agnes Maclehose in 1787 – 1791 produced a famous, romantically-charged correspondence (in which Maclehose was named Clarinda). ‘Ae Fond Kiss’, one of Burns’s most beloved songs, was written for Maclehose. 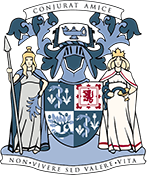 Maclehose was born in Glasgow in 1758, daughter of surgeon Andrew Craig, who was a member of the College (then known as the Faculty). She married the lawyer James Maclehose at 18, but left him just before the birth of their fourth child in 1780. She returned to live with her father, then a widower, but he died soon after in 1782. As a dependent Agnes received a pension of £8 from the College. 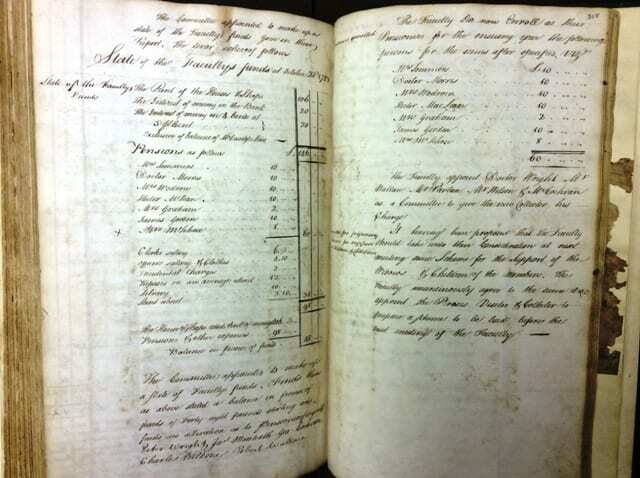 The Minutes of 1782 below show the application for the pension, and its approval. Maclehose moved to Edinburgh, still married but formally separated from her husband. 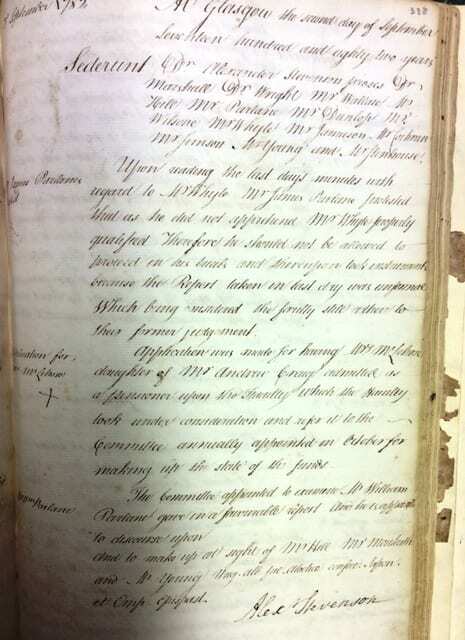 The College minutes throughout the mid 1780s list her as a recipient of the pension, known as the Widow’s Fund. This continued until 1787, the year she was introduced to Burns (who was by now being celebrated in the capital as a literary star, after the publication of his Kilmarnock and Edinburgh editions). Maclehose, a poet herself, was keen to meet Burns, and did so in December 1787. However, in the preceding month there was a change in her personal circumstances. In the Minutes of 6th November 1787, there is an entry stating that the Widow’s Fund committee “submit to the consideration of the Faculty, whether or not Mrs McLehose [and another recipient] are any longer objects of their charity” (see image below). Days after, the decision is taken that “instructions as appointed to be given immediately to Mrs McLehose [and another recipient] that they are struck off the list of Pensioners” (see image below). No further context or explanation is given in the Minutes for this decision. The exact date of this entry is unclear, but it appears to be sometime between 6th and 23rd November 1787. Less than two weeks after this she met Burns for the first time, sparking a relationship that produced remarkable correspondence, and one of the greatest love songs ever written. Further research into Maclehose’s circumstances leading up to this fateful meeting would be a useful avenue for scholars with an interest in the women who feature strongly in Burns’s life and work. The manuscript of ‘Ae Fond Kiss’ will be on display at the National Library of Scotland at Kelvin Hall, Glasgow, on 25th January 2017. For more information, see the NLS website.